Looking for free rent invoice templates? We've got you covered! Do I need more than just a rent invoice template? We know that as a landlord collecting rent can be incredibly difficult, so we've made your life much simpler. 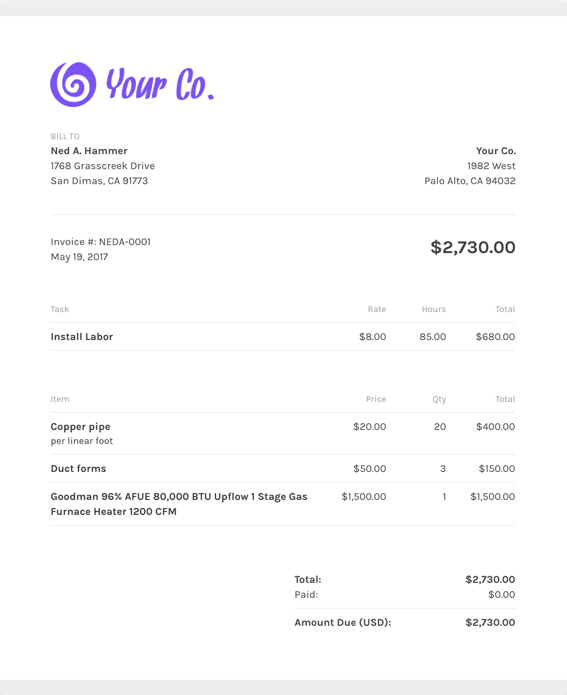 With a rent invoice template, you can just email out invoices to your renters. We even have a system set up so you can create emails to automatically send to customers that are late on their rent payments. What should I include on my rent invoice template? An awesome selling point about ZipBooks is that you can pre-enter all the details of your invoices into the invoice template. Using ZipBooks for your rent invoice means never sending off an invoice without your own company information on it (oops!). We’ve collected data from tens of thousands of invoices and use it to score your invoice based on what information you include so you’ll get you paid faster. Why should I use ZipBooks’ rent invoice template to create and send my rent invoice? Late payment reminders (free! ): Reminding clients to pay isn’t that fun but when the retainer is running low it’s nice to know that you can setup logic based on when you sent out the payment and how long the client has gone without paying. You can setup an unlimited number of reminders that communicate an escalating sense of urgency about non-payment. No one wants to stiff their lawyer, but if they are slow to pay you can outsource the tedious followup task to ZipBooks.